There are currently 3,673 users on this website. What's The Scott# Uo10 On Fawn Paper? but does anyone know the Scott # on a UO10 on Fawn? Looks like a variety stamp with broken "T" at top. It's in pristine condition. Front and back the same solid fawn color with no variations in shade. The bottom part of the T foot is missing. The E and P also have flaws. It looks like a "One Off" with a hair or something on the plate. The paper color is what stumps me! I was searching to see if this was a paper essay. I do understand that the T is small. I have several UO35 comparison stamps. I should have said the Dot is missing. Sorry for not describing accurately. The Scott# for UO10 on Fawn paper is what I am trying to figure out. OK, got you. But what is "fawn" paper, and where did you read this? If your assessment of the paper being fawn is correct, then this envelope (or cut square thereof) is a Scott# UO55. Thomas, You're correct! I think what fooled me is that it was in one of my stock books next to some UO35s so the Red looked like Vermilion. You guys are the best! You always figure things out! ". . . what is "fawn" paper. . ."
Fawn is a paper color. 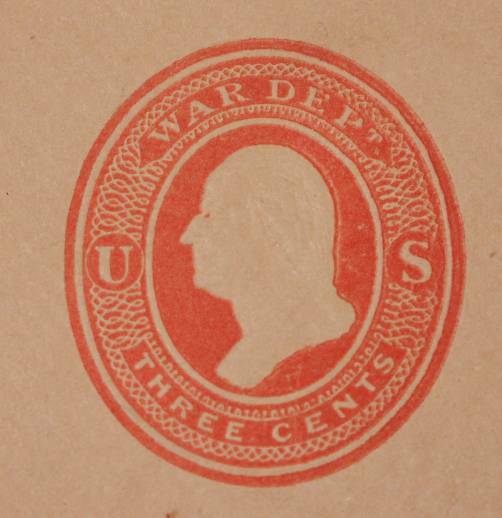 It was one of the optional envelope colors offered by the USPOD in the 19th century. It took 0.91 seconds to lick this stamp.